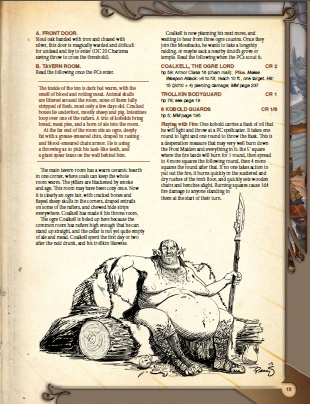 Meet the Trollkin… And Drive Them Into the Sea! The trollkin and their shaman have come to a village by the sea, stormed its walls, and taken all the villagers as slaves and property. They have eaten their way through the saltfish, devoured the herd of sheep, and might be planning to eat the PCs next. Then, one escaped villager begs strangers on the road for help… And gives them the chance to shine as true heroes striking down raiders of pure evil. 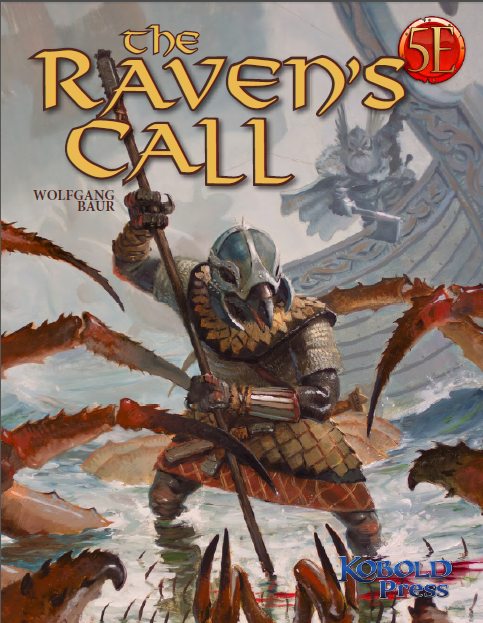 The Raven’s Call is an adventure for 3rd level characters that brings mythic power and a true rescue story for 5th Edition, and introduces locales and NPCs that players will never forget. 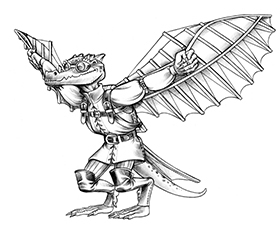 It offers new monsters and new magic in the unique style of Wolfgang Baur, one of the leading RPG adventure designers. 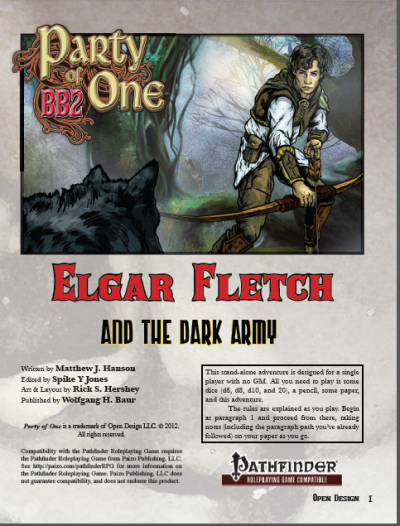 A truly heroic 5h Edition adventure for 3rd level PCs near any wooded shore. 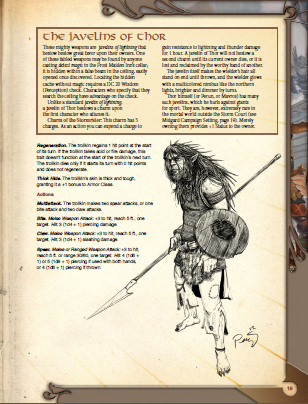 Includes 6 pregenerated characters for immediate play or for use as NPCs. 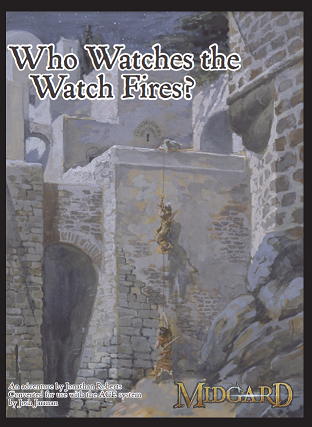 This adventure takes some staples of fantasy (and historical, for that matter) stories and weaves them into game form. At the core of things, there’s a village. It is the party’s job to defend them against a veritable horde of bandits who are out for food and other plunder rather than a brawl. It’s the sort of thing that will make a successful party FEEL heroic, even if it doesn’t contribute that much to party coffers. There’s quite a lot packed in to the adventure, which should occupy but a couple of days total of the party’s time. Several hooks are provided to get them involved, interestingly it’s best they start a fair way away from the village of Nargenstal, because once they get close enough to see what’s going on, fighting is almost inevitable. Yes, there are plenty of opportunities for combat, but the adventure works best if the party has scouted and met survivors – they will become much more involved in the outcome if they know why they are fighting rather than operating in ‘see monster, hit monster’ mode. The range of options provided for ensuring that this happens is quite impressive – use as many as you like, in some ways the adventure is quite a sandbox in which what the party decides to do dictates how you’ll run it. As written, the adventure is located in the Midgard Campaign Setting, but it should be reasonable straightforward to transplant it into your own campaign world, although you might have to leave out some references – leylines, for example – unless you have them in your world too. 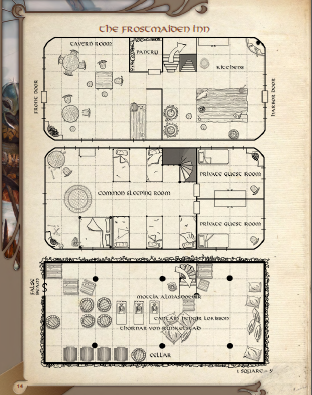 Resources are excellent, with lots of background and little snippets to help you bring the scene to life, and notes on how those the party will encounter will react – and fight, come to that. If there’s anything novel about the combat, the relevant game mechanics are laid out clearly just where you need them. There’s a nice sketchmap of the village itself (without many annotations, so it’s player-safe) with a matching numbered list of locations and details, this being clear enough to follow even though there are no numbers on the map, and full floor-plans of the village inn. Some pre=generated characters are provided should you want to jump straight in. Whilst it might seem a simple adventure, to run bandit invaders out of a village and get the locals back in, the whole thing is presented seamlessly with a compelling freshness that makes it a joy to run.